While reading I found myself relating to all 4 characters and learning from their personal growth. O'Gonuwe found the perfect balance of social consciousness and humor in this novel. It is uncommon to be furious about the social injustice while reading one page then burst into laughter three pages after. This is why, Just Like A Caucasian is an outstanding book. O'Gonuwe shows there are countless societal injustices, moments of sadness and heartbreak but there are also periods of joy and laughter. This novel is real. It takes you into the lives of 4 individuals and through their moments of sadness and joy, we see from their eyes, how they persevere in a society that was not designed for them to thrive. 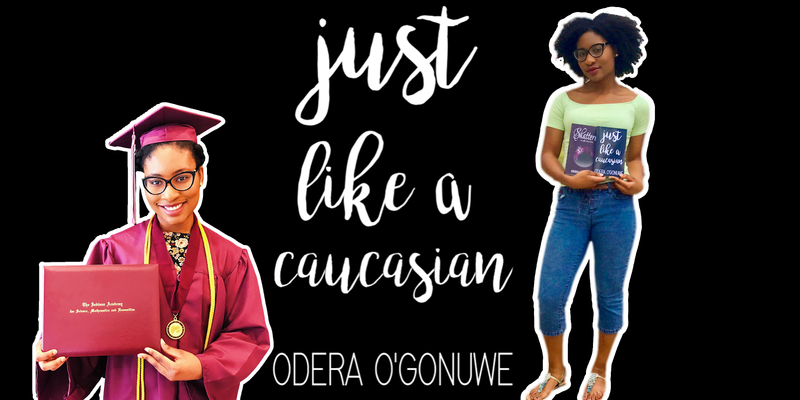 I got a chance to ask Odera O'Gonuwe a couple of questions about the process of writing this novel and how she brought these characters to life. O'Gonuwe just graduated high school this spring and is about to start her freshmen year of college. Wow! Can we take a moment to appreciate this example of Black excellence. A published author while in high school?! I could barely complete my research papers in high school without having a mental breakdown and O'Gonuwe is out here writing a whole novel. Yes, Black excellence!!! 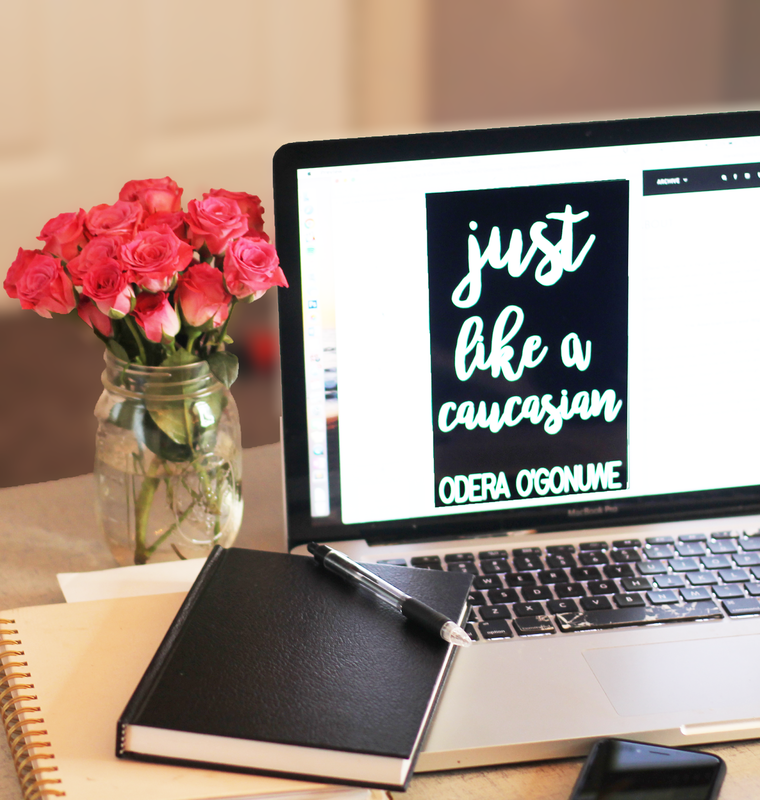 I was inspired to write “Just Like A Caucasian” when I first heard of Trayvon Martin in 2012. His case was my first introduction into what I came to know as police violence. This novel is a creative manifestation of my desire to understand racial relations in America. Without giving too much away from the novel. Why did you pick the title, “Just Like A Caucasian”? I picked the title “Just Like A Caucasian” as a summation of the story of racism. Even though the story focuses on minorities, the title is a reminder that we would not have racism if not for white supremacy. Did your background, heritage, and upbringing play a role when writing this novel? If so, how? Nigerian-American born to immigrants. I see and conceptualize life from that view point. I also see racism from my reality of life, a different way from the way someone else would perceive it. What inspired or sparked the birth of each character? My focus in creating the characters was not about their individual attributes. Instead, I wanted to portray the myriad complexity of minorities as they are not a monolith. Mohammed was a rich, black agnostic whose parents were muslims. Ndidi was first generation American born to immigrant Nigerian parents, raised in Nigeria before relocating to the US. Her family was also very rich. That is not the typical story of black people and yet, there are many black people who can relate to those characters. This novel dives into serious topics such as race and religion. How important do you think it is for people to talk these topics in today’s climate? Why do you think people shy away from openly talking about issues like discrimination, institutionalized racism and islamophobia to name a few? actions are not all intentional. Understanding the impact of such actions on others would result in a change of behavior. People often do not talk about these topics because they do not want to offend others. They think that sharing their point of view may be distasteful. Also, many people do not spend time to understand social issues and their impact. They therefore do not want to show their ignorance. How did you find a way to seamlessly add humor to a novel that touches on very serious and important issues? I write about humans. In “Just Like A Caucasian”, these humans’ primary focus was studying racial relations and power dynamics in the United States. But my characters are still people, and people laugh, cry, smile, and experience an array of different emotions. It was important for me to present human aspect along with the racial theories. On another note, it is humorous to think of the way white supremacists struggling for a livelihood assume that they are better than other people, some of whom can feed them.